In a number of previous blog entries I was praising some of the activities of the proprietors of Es Fangar, a beautiful finca not far from Felanitx but, actually on territory of the Manacor municipality. Now, however, there are new reasons to be scornful, again. On a recent visit to Es Fangar I found out to my surprise that access to large areas of the property was denied where only a few months ago it had been granted. I wanted to ramble along the expansive natural beauty of the paisatge (landscape) but, was merely allowed to follow a path right on the edge of the property right along the wired fencing of Es Fangar. Es Fangar is located to the southeast of Son Macià, bordering with the municipality of Felanitx. The finca is the largest property of Manacor and one of the largest of Mallorca. From the 15th century onwards, Es Fangar belonged to the Truyols family, until the beginning of the 20th century when it was bought by the Bonnín family. In 2001 or thereabouts, the finca was bought by a German industrialist and his family who have been busy rebuilding the manor house, still unfinished after almost ten years of construction. At the same time, efforts were undertaken to recover some of the agricultural land, planting vines and olive trees and building fences to reign in a large number of horses. A substantial part of the estate is listed as ANEI (Natural Area of Special Interest). A number of caminos (walkways) on the land appear to have been traditionally open to the public, or so it was claimed by the Plataforma Pro Camins Públics i Oberts who took the case to tribunal when access was rigidly cut off by the Germans. 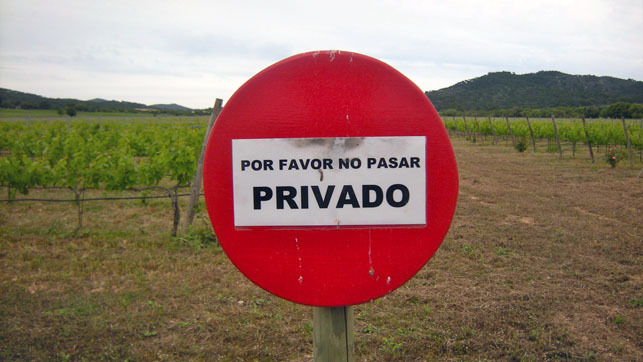 Just over one year ago, an out-of-court agreement was reached between the bickering parties whereby the proprietor agreed to give free access to most of the caminos on his land except for those closest to his family abode. Money was also promised by him to be paid and some land was to be ceded to the local community of Son Macià. I understand that this binding agreement still lacks the signature of the town hall in Manacor. Money has not been received by whoever it was promised to and no transfer of land has been signed so far. Perhaps it is for this reason that most caminos are now off-limits to the public, once more. 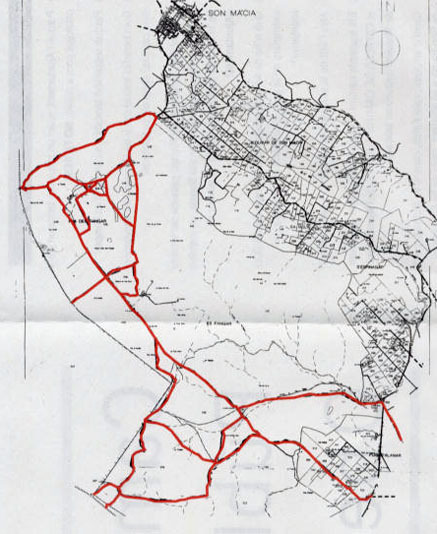 Virtually all of the caminos shown on the map (below) are now closed. There may be more work for the tribunals in store. 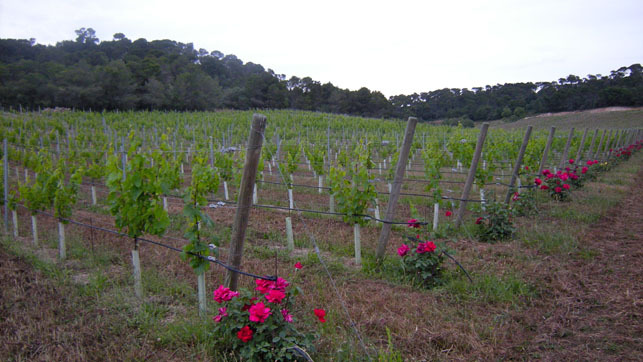 During my recent walk, my curiosity was aroused by the planting of a rose at the beginning of each row of vines. When I later inquired I was told that the roses serve as an indicator for the watering needs of the vines. When the rose appears to be droopy, it is an indication that the vines are also lacking in strength. I was also told that Es Fangar enjoys the services of an excellent enologist from the Manacor area. I have not yet found an outlet selling any of the Es Fangar wines. A new celler (bodega) has been built at the Polígono de Felanitx, though, for the Es Fangar people for the sole purpose of producing and storing the ambrosial nectar. Thus far, I have also not yet found any Es Fangar olive oil for sale. I would put any scorn aside temporarily to be able to try the wine as well as the oil, wouldn’t you agree? The photos were taken near Son Macià, between Felanitx and Manacor, Mallorca, Baleares, Spain. The date: May 18th, 2011. The time was 18:47:38 and 20:26:29, respectively. The map was borrowed from the Internet, courtesy of idd02ucg.eresmas.net.